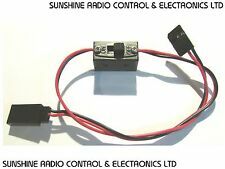 RC Receiver Operated Electronic On / Off Switch. Plug the single lead into one of your spare channels for switching lights, bomb dropping, smoke systems, canopy operation and other low current applications. On Off Switch JR 3 Pin. Using a 3 pin JR black connector. Suitable for most receivers. The Turnigy switch will complete a circuit when the radio channel passes 50%. Maximum throughput : 10A / 30v. Fitted with a Futaba (J) style male plug at one end and a Futaba (J) female plug at the other. JST BEC On/Off Switch Harness. Ideal For: RC Cars, Acom Receivers & Boats etc. Add to Favourites. We will always find the cheapest quote based on the weight of your item. 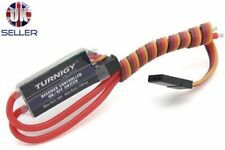 Heavy Duty RC Switch LED Receiver Battery On Off Futaba JR Connectors Lead UK. Battery with Futaba JR Lead Connectors. This is a heavy duty switch with an On Off LED and a spare port for use with a female Futaba JR cable for charging etc and can be closed with slider cover.Also has a switch Guard. Receiver Operated 7 Function Multi Remote on / off Switch. The Multi-Remote Switch is essential for all R/C models, Car / Boat / Heli or Plane. Universal plug for Futaba/JR, JR(Futaba Male), Futaba Female. - Make use of 22AWG red black soft silicon wire, high temperature resistance. If you do not receive our reply within 48 hours, pls. If you are satisfied with our service, pls. Rx Receiver On Off Switch JST input, RX plug output. Plug type: JST input, RX plug output. The Multi-Remote Switch is essential for all R/C models, Car, Boat, Heli, Plane and also has special modes for Rockets! Receiver lead. Full Instructions can be downloaded HERE. It simply plugs into a spare channel on your receiver and is operated via a switch on your radio. With two sets of LED's attached: Off - Set A on - Set B on (Set A off) - Set A & B on - Set A & B pulse (x3 then repeat ) - Set A & B off. The switch is fitted with a JST female plug at one end and a Futaba JR male plug at the other. The Battery box is fitted with a JST male plug with a cable length of 150mm. Total length of switch harness - 220mm. Plug the single lead into one of your spare channels for switching lights, bomb dropping, smoke systems, canopy operation and other low current applications. Any item that is designated 'Sold As Seen' implies no warranty. 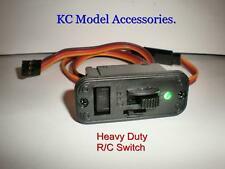 Brand on/off switch Please check out my other RC parts Free postage. 3-Channel FPV Video Switcher. 3-Channel Video Switcher is a great accessory for any FPV model. 1x 3Ch Video Switcher. '-' is negtive pole, ' ' suspend, 'S' is receiving video signal. Any item that is designated 'Sold As Seen' implies no warranty. Universal plug for Futaba/JR, JR(Futaba Male), Futaba Female. - Make use of 22AWG red black soft silicon wire, high temperature resistance. Rc Hyper 7 Receiver Box With Switch In used condition. Please study the photos carefully before you buy to make sure that you are buying the correct item due to the nature of the hobby I can not accept returns on this item. The Turnigy switch will complete a circuit when the radio channel passes 50%. Connect it to your flap or gear channel for an instant on/off switch! 1 x Turnigy RC Switch. Maximum throughput : 10A / 30v. 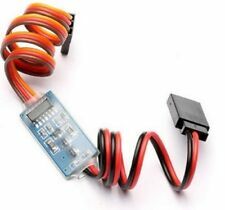 It can be used on 1/8 and 1/10 car, suitable for HSP RC car. Type: RC Model Part & Acces. 1 Receiver Switch. Suitable for most receivers. Color: Shown As Pictures. Plug the single lead into one of your spare channels for switching lights, bomb dropping, smoke systems, canopy operation and other low current applications. Weight: 7g. Height: 3mm. Width: 13mm. Length: 30mm.